This was the fouth and largest of Frank Lloyd Wright’s Mayan revival style textile block construction homes in Los Angeles. 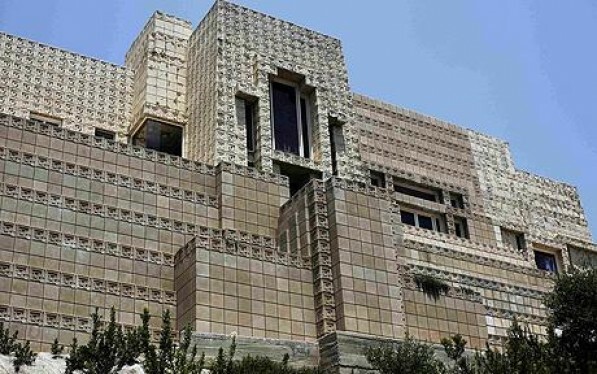 It was built by his son, Lloyd Wright for department store owners Charles and Mabel Ennis, between 1923-24. The home was damaged by the 1994 Northridge earthquake and by heavy rains in 2004-2005. Billionaire Ron Burkle acquired the home in 2011 and has agreed to partner with interested historic societies to restore the home and to make it available to public tours. This entry was posted on Wednesday, November 17th, 2010 at 3:55 pm	and is filed under architecture & design, notable homes. You can follow any responses to this entry through the RSS 2.0 feed.